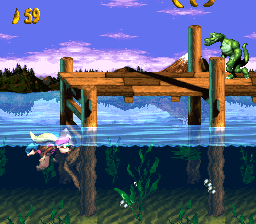 Lake Orangatanga is the first world of Donkey Kong Country 3: Dixie Kong's Double Trouble! 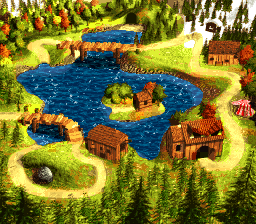 This world takes place at a large lake, and has fertile land and pine trees seen from the overworld. Lake Orangatanga has numerous boardwalks, along with a few mills. Its lake has numerous Kocos. In the north-eastern area of the lake, there is a snowy region with several wooden cabins. 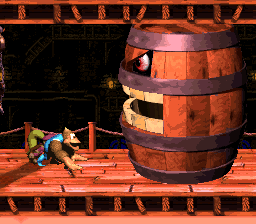 The world's boss is the giant barrel Belcha, who is located inside a mill in the south-east region. 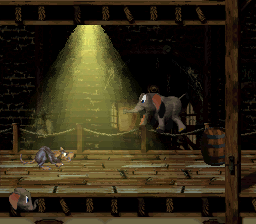 The world's Brothers Bear is Barnacle, who has his own island in the middle of the lake, Barnacle's Island. 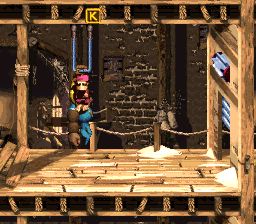 He was replaced with Bachelor in Game Boy Advance, and the location was renamed to "Bachelor Pad". 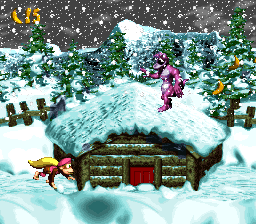 The Banana Bird Cave of this world, named "Smuggler's Cove", is located west of the snowy region. 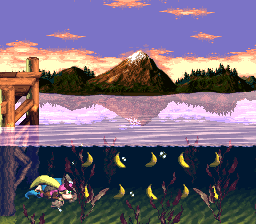 Dixie and Kiddy Kong are able to freely swim in the overworld's lake, and can access the Banana Bird Cave by swimming under a dock.